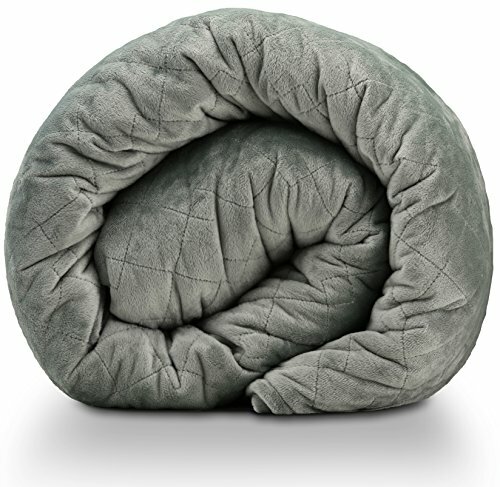 Weighted Blankets - DON'T BUY BEFORE YOU READ THIS! This is one of the best methods for passively reducing anxiety and getting a better night’s sleep. If you haven’t heard of it yet, I’m glad you got here! Weighted blankets are being used for everyone from kids to adults to help reduce stress and promote better sleep habits. So what exactly is a Weighted Blanket? Also known as weighted gravity blankets, they can be made from a variety of different fabrics. What’s special is that they’re designed to hit different pressure points on your body. Word is that the added weight gets your brain to release mood improving neurotransmitters like dopamine and serotonin. That’s what produces the calming effect. They’re calling it Deep Touch Pressure (DTP) and it’s all about gentle, distributed weight. The good news is that therapists, educators and parents are seeing positive results from using it. What does all that mean? Basically, these things are incredibly comfortable and make you feel all snuggled in. Yes, that’s the scientific term for it. Snuggled in. Ok, ok. I’ll be a little more official about it. Studies have shown that light touch tends to alert the nervous system and even cause panic. Meanwhile, deep pressure is being found to have the opposite effect. There have been a number of excellent studies backing up all the hoopla. If you want to get into the nitty gritty of it check out this study from the Journal of Child and Adolescent Psychopharmacology. If that makes it sound like weighted blankets are just for kids, they’re not. Yes, it’s true that they’re being used to help with child and adolescent issues from anxiety to autism, but adults can benefit from the same stimulation. How Much Should Your Blanket Weight? Kids: 10% of body weight plus 1-2lbs. Adults: 10% of ideal body weight. It doesn’t have to be exact. Up or down a pound is fine. If you like the feeling of more pressure just add more weight. Here’s a chart that shows how to figure out the right amount of weight for you. Those are the generally accepted guidelines. If it feels like it’s too much weight, always consult your health care professional to adjust and fine tune. Here’s an important consideration: NEVER USE A WEIGHTED BLANKET ON CHILDREN UNDER 3 OR ANYONE WHO COULDN’T EASILY REMOVE IT FROM THEMSELVES. When comparing the prices of the weighted blankets make sure to compare blankets that are the same size and weight. Are Weighted Blankets Only For Sleeping Under? No, not at all. They can be used in many ways to provide calming pressure and relaxation. Try it across your lap or torso. You can wrap it around your shoulders or even just your legs. Adjust it from a little coverage to your whole body. It’s up to you to experiment and enjoy the benefits. 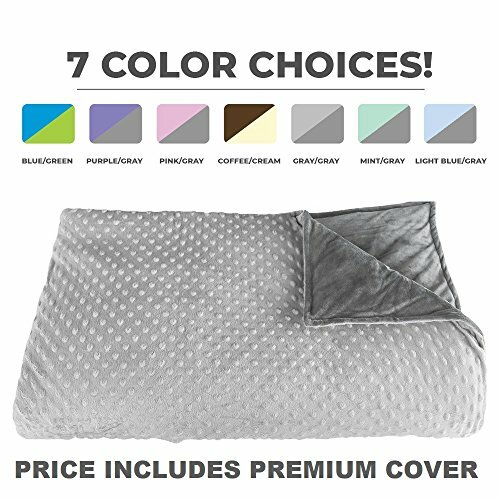 The Platinum Health Premium Weighted Blanket is a high quality blanket thats worth every penny. It has 2 part construction for easy washing. Taking off the cover is a breeze and it washes and dries fast. The cover material is made from Minky Polyester which has a smooth and silky feel to it. What we really like about this blanket is that it looks just like a normal blanket. The therapeutic weighting system is completely hidden by the cover. The blanket is a generous size with a dimension of 60 Inches by 80 inches. This blanket comes in 12 lbs weight only because some studies show that many users prefer this weight. This is my pick for #1 Winner because so many people love this blanket. Sorry, no prices available at this time. 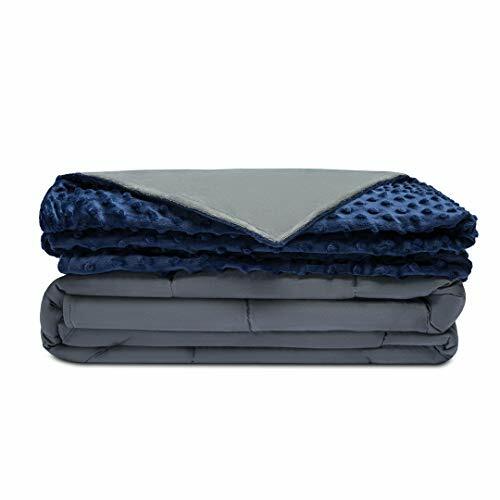 The Weighted Idea Cal Weighted Blanket is an excellent high quality weighted blanket. We love that it comes in so many colours and weights, and sizes. Its really so customizable that you’ll have no problem getting the exact blanket to suit your needs. The largest size fits king size beds and is perfect for couples. The removable duvet cover is easy to clean and is made of high quality materials. You can also buy the Minky Polyster duvet cover if you prefer the feel of that material. 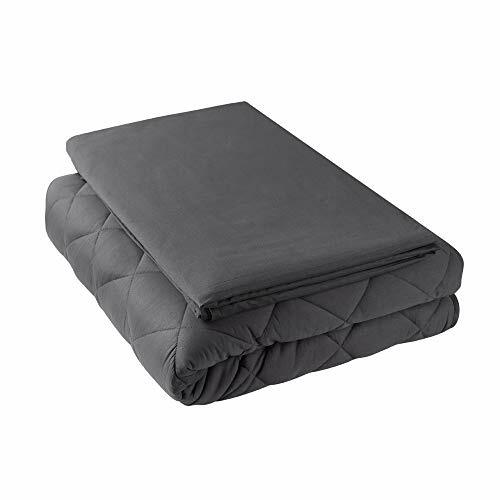 With a 100% customer satisfaction guarantee you can’t go wrong with this weighted blanket. This is my pick for #2 Winner because there are so many different weight and colour options and you can return the blanket if you don’t like it. The Rocabi Weighted Banket really gets the job done. With plush micro-fibre and Minky fabric is feels so cozy and comfortable. Its separates for easy cleaning of the duvet cover. Its my pick for #3 Winner because some people have said that the blanket gets too warm. There are three weight choices: 15, 20, and 25 lbs. At 60 by 80 inches its large enough for a Queen bed. We recommend that you upgrade to the Cotton & Minky cover option. Another plus is that it looks just like a regular comforter. This is a great blanket overall! The Deep Sleep by Miran comes in 3 weight options: 15, 20, 25 lbs. It is 60 by 80 inches which its a good size for your double bed or queen size bed. 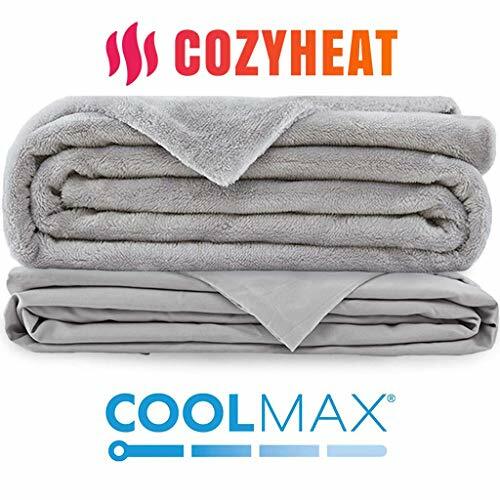 Its my pick for #1 Winner because its a great blanket for the price and they stand behind their product offering a full 2-year warranty. Its made of the highest quality cotton and milky polyester which feels as soft as cashmere. The Minky cover is machine washable. We really like how this blanket feels and how passionate the makers at Miran are about producing a high quality therapeutic weighed blanket. Great buy! 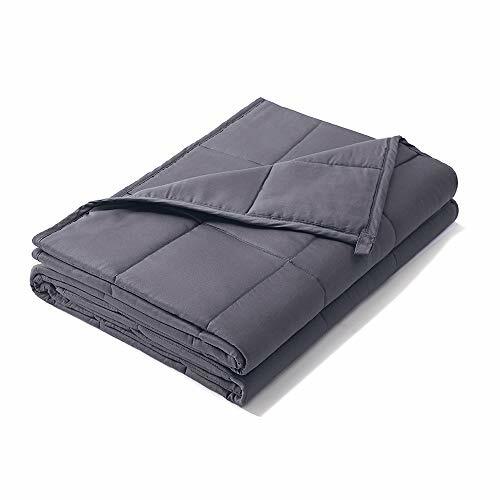 The Quality Premium Weighted Blanket is a reasonably priced good quality blanket. Its made of 100% cotton and filled with hypo-allergenic pellets which acts as the weight. The blanket is crafted with small square stitching to keep the pellets in place and evenly distributed on your body. It comes with a removable duvet cover for easy cleaning. Its also good to remove it if you want to be cooler in the summer nights. Its my pick for #2 Winner because it doesn’t come in as many larger sizes like the other blankets in this report.The largest available size is 48″ by 78″. If that size works for you this is a great buy. The company offers full refunds if you aren’t satisfied with the product. Its a great low risk purchase and is sure to do the job. The Hypnoser Weighted blanket comes in a variety of weights and sizes. If you have a king size bed they have a blanket large enough for you. The cover is 100% organic cotton and is removable for easy cleaning. This is my pick for #3 Winner because some people have said that the blanket is too heavy when they order the recommended weight. You might want to order it at a little bit less weight than is recommended for you.The diamond pattern of the blanket ensures even distribution of weight in the blanket. The quality workmanship in this product is easy to see and feel. This is a great value! The ZonLi Premium Weighed blanket is a great quality blanket at a very reasonable price. The small square design ensures that the weight pellets distribute evenly on your body. The inner blanket is made of 100 % cotton. The blanket doesn’t have a removable cover but you can still machine wash it. You can also add different covers when you buy the blanket. Its my pick for #1 Winner because it has great reviews and is affordable. The YnM weighted blanket is by far the most customizable of all the weighted blankets. Its a great option for kids. There are over 10 weight and size configurations as well as 20 choices for colour and patterns. Its also reasonably priced and thats why its my pick for #2 Winner. For adults it even comes in King size and you can have over it with a Minky Polyester soft touch over. The weighted inner part of the blanket is 100% breathable cotton which is also machine washable. For easier cleaning using a duvet cover is best. It comes with a free matching colour duvet cover. Nice bonus! This is a great buy and you and your kids will love it! We really like the value of this blanket. It comes in a variety of sizes and weights and also has a number of colour options.The company stands by the product and offers a 100% customer satisfaction guarantee. Its my #3 Winner because some people have complained about the quality of the blanket. It still makes the list because most of the reviews are positive and its a good blanket for the price. You can order it in a large size as well for queen and king size beds. The small square pockets are designed to keep the hypoallergenic pellets evenly distributed. You can also order the Minky polyester soft to the touch cover. 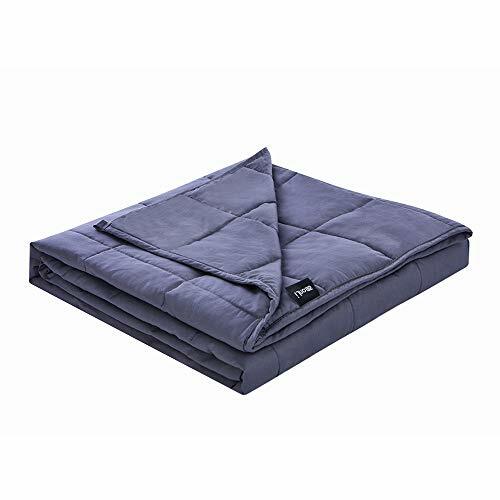 Weighted blankets are a very useful and work very well in reducing anxiety passively and giving you a better night’s sleep. Most of these blankets just look like normal blankets so you can feel comfortable in using them anywhere in your house. Whether the blanket is for you or your kid, you can greatly benefit from using them . There are many styles and materials and colours so you can easily match them to the decor of the room. There are also many sizes and weights and by looking at the chart I provided you should be able to find the right one for you. I hope you enjoyed this report and get great use out of your weighted blanket. Want to know more about Weighted Blankets?